Traveling in Ecuador . . . There are many options for getting around Ecuador, and your choices will depend on several factors - the time you have available, the sights that you would like to see, your preferences for travel. The most rapid way to get around is by plane, and there are several routes to consider for your journeys. You can also hire a car with a driver to create a unique itinerary. In addition there are frequent executive taxi services between the major towns and cities that pick up three or four passengers in large cars. You can also hire a car from one of several car hire agencies. And of course there are buses - from executive long-distance buses to regular inter-provincial buses, to smaller provincial buses. In practice you may end up with a combination of modes of transport depending on where you will be traveling to. Flying around Ecuador . . . There are several airlines that fly regular routes around Ecuador - Lan, Tame, Avianca, Aerogal. There are daily flights or two or three flights per week between various principal cities - Quito, Guayaquil, Cuenca, Manta, Loja, Tena, Esmeraldas, Lago Agrio, Coca, Baltra, San Cristóbal. 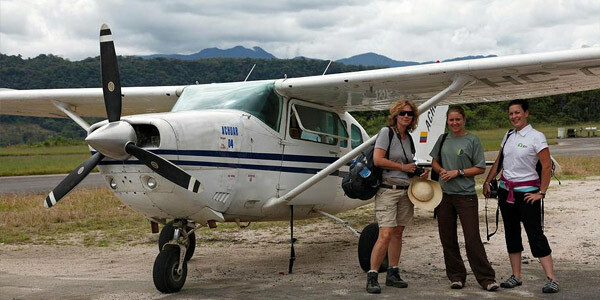 In addition, to get to some of the more remote Amazon lodges it is necessary to fly in a small plane. Contact us if you have any questions about getting around Ecuador by plane, and if you would like us to make reservations for you. By Car around Ecuador . . . There are a number of ways to travel by car around Ecuador. You can hire a car and driver for yourself and your family or group. This can cost around $120-$180 per day depending on your route and the distances. For 3 or 4 persons this can be a reasonable cost in comparison with the ability to have total control over your travel. There are also regular executive taxi services that run between the major destinations such as Quito to Santo Domingo or Esmeraldas or Cuenca, etc. The cost varies with the distance. Quito to Santo Domingo takes about 3 hours and costs $15. The cars are large and generally take 3 or 4 passengers and will pick you up from your hotel or other accommodation. This can be a good option for a person traveling alone who would rather not have to deal with buses on at least some routes. We will be happy to find more information for you about either of these services. You can also hire your own car to explore Ecuador. There are several international companies that offer services here, in addition to a few local firms. Costs generally work out around $60-$90 per day for the average car with all the insurance waivers and required extras. By bus around Ecuador . . There are executive buses that go between the principal destinations in Ecuador. Improvements to the road system in recent years have reduced travel times. Generally these are comfortable and safe. The cost is around $1.50 per hour with average journeys taking around 4 - 8 hours. Quito to Cuenca for example takes around 8 hours and costs about $11. There are buses at night too that make a good option for the economy-minded traveler. Regular bus services are frequent and fast around Ecuador and generally there is not much need to think about booking in advance or worrying about the schedule, especially between the major destinations. The cost is around $1.20 per hour of travel, and the buses are generally safe, although there can be petty thieves who try to rob unsuspecting tourists between the major tourist attractions such as routes to Baños and Otavalo. It is safe to put your bags in the hold beneath the bus, but best to keep your pack on your lap for the journey rather than at your feet or on the overhead rack. That way you will have no problems. While buses tend to have regular departure times, they generally do not have a fixed arrival time - the driver will get there as fast as he can. There are exceptions with the executive buses, but the regular buses tend to arrive as soon as possible. The smaller provincial buses that go to more out-of-the-way places can be a great way to see the real Ecuadorian lifestyle, and are worth traveling on to get a better feel for the character of the country. At the coast there are also "rancheras," truck bodies with wooden seats on the back with all kinds of local merchandise slung on the roof - definitely worth at least a short journey if you are traveling on the coast! We recommend a combination of travel methods to get the most out of your time in Ecuador. 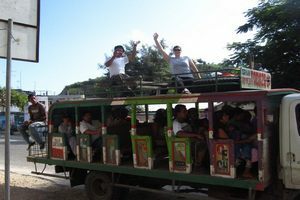 While it is great to travel fast and directly from destination to destination, at times the journey can be as interesting as the destination itself, and we encourage all travelers to experience as much as they can of the real character of the country by moving about at least some of the time the way that the Ecuadorian people themselves do. "Traveling to Quilotoa by local bus was such a memorable experience, being sat beside local people in their traditional dress as we climbed through the mountains, and even with a bag of clucking chickens under my seat!"